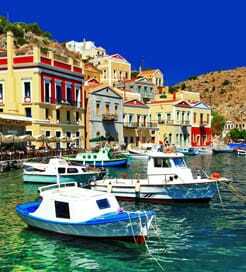 There is no shortage of options to choose from when it comes to selecting a ferry from Sporades Islands to Greece. There are 5 ferry companies with a combined offering of 22 Ferry Routes connecting Skiathos to Alonissos, Chora (Skopelos) to Alonissos, Glossa (Skopelos), Volos, Skiathos & Mantoudi, Alonissos to Chora (Skopelos), Volos, Glossa (Skopelos), Skiathos & Mantoudi, Skiathos to Alonissos, Volos, Glossa (Skopelos), Chora (Skopelos), Agios Konstantinos & Mantoudi, Glossa (Skopelos) to Skiathos, Chora (Skopelos), Volos, Alonissos, Agios Konstantinos & Mantoudi, Chora (Skopelos) to Alonissos, Glossa (Skopelos), Volos, Skiathos & Mantoudi, Alonissos to Chora (Skopelos), Volos, Glossa (Skopelos), Skiathos & Mantoudi, Glossa (Skopelos) to Skiathos, Chora (Skopelos), Volos, Alonissos, Agios Konstantinos & Mantoudi, Chora (Skopelos) to Alonissos, Glossa (Skopelos), Volos, Skiathos & Mantoudi, Alonissos to Chora (Skopelos), Volos, Glossa (Skopelos), Skiathos & Mantoudi & Glossa (Skopelos) to Skiathos, Chora (Skopelos), Volos, Alonissos, Agios Konstantinos & Mantoudi. The fastest route between Sporades Islands and Greece is Skiathos to Glossa (Skopelos) with a crossing duration of around 15 minutes. With so many routes on offer we make it simple by comparing all similar routes in one search so you can quickly find what you are looking for. The Sporades, meaning ‘those scattered’, are a group of islands along the east coast of Greece in the Aegean Sea. Of the 24 islands, only 4 are inhabited: Alonnisos, Skiathos, Skopelos and Skyros, which are characterised by fertile plains, dense pine forest and beautiful beaches. They offer a slightly different Greek island experience than most, with their traditional architecture, relaxing atmosphere and secluded coves. The Sporades have something for everyone; Skopelos and Alonissos are best suited to families, whilst Skiathos has lively bars and more in the way of an exciting nightlife. Finally, the least travelled island, Skyros boasts an attractive capital town and quiet beaches. Given their proximity to the mainland, there is a wide choice of high-speed sailings to a few locations on the eastern coast of Greece. You can also choose from equally frequent routes within the Sporades, which are all operated by one of the country’s most popular ferry companies. Greece is one of the world’s most visited countries. With the Aegean Sea to the East of the mainland, the Ionian Sea to the West, the Mediterranean Sea to the South and a vast number of islands, Greece boasts some 16,000 kilometres of coastline. Greece is a country rich with diversity, from its mountainous mainland to the stunning islands with their whitewashed houses and blue-domed churches. Many of the Greek beaches have been awarded the Blue Flag, while the country’s rich history and legacy has left it with 18 UNESCO World Heritage Sites. The Greek mainland is easily reached by ferry across the Adriatic Sea from Italy while domestically, due to the sheer number of islands, there are many ferry companies and a range of services on offer. The majority of the domestic ferries are modern, though the class of ferry differs based on the journey type. The longer routes are served by conventional passenger ferries, while the shorter inter island routes are served by high speed catamarans and hydrofoils.